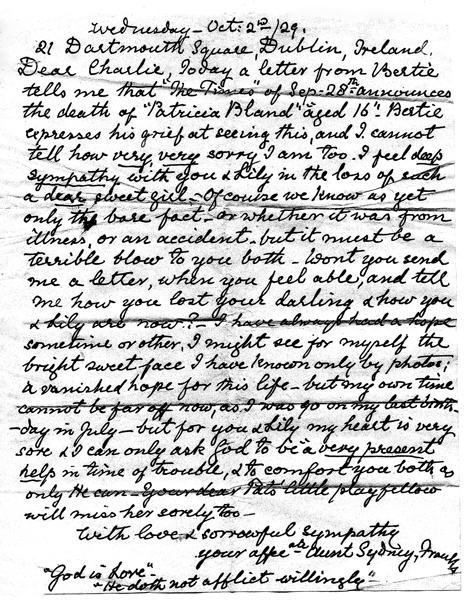 Today a letter from Bertie tells me that “The Times” of September 28th announces the death of “Patricia Bland” aged 16. Bertie expresses his grief at seeing this, and I cannot tell how very, very, sorry I am too. I feel deep sympathy with you and Lily in the loss of such a dear sweet girl. Of course we know as yet only the bare fact – or whether it was from illness, or an accident – but it must be a terrible blow to you both. Wont you send me a letter, when you feel able, and tell me how you lost your darling and how you and Lily are now ? I have always had a hope sometime or other, I might see for myself the bright sweet face I have known only by photos; a vanquished hope for this life – but my own time cannot be far off now, as I was 90 on my last birthday in July – but for you and Lily my heart is very sore and I can only ask God to be a very present help in this time of trouble, and to comfort you both as only He can – Your dear Pat’s little playfellow will miss her sorely too. You affectionate Aunt Sydney, Franks. Sydney Franks was a sister of Emma Frances Franks who was Charles Loftus Bland’s mother. The Franks family had seven girls and five boys.